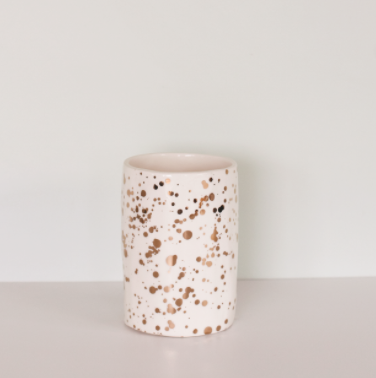 A solid ceramic vessel with gold metallic splatter and gloss glaze. Ideal for utensils, flowers, brushes... Whatever your fancy! Looks quite stunning on it's own or in a grouping of like-decorations. Celebrate natural handmade. Size: 160mm x 105mm diameter x 5mm thick. Presented in cotton drawstring bag. Being handcrafted, there will be variations in the finished product.